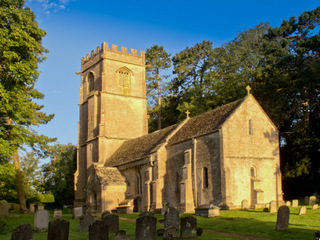 At nearly 1000 feet above sea level, Elkstone church is the highest in the Cotswolds. Described as ‘a prayer in stone’, it is famed for its Norman architecture, stone carvings and golden light. The original church, begun in 1160, consisted of a nave and chancel, with a central tower above the chancel. This tower either collapsed or was taken down in the 13th century. 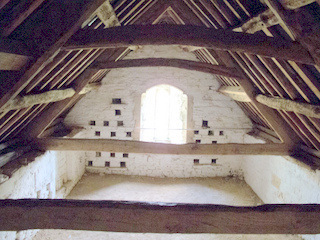 When re-roofing the chancel, the builders also raised the height of the chancel walls, forming a chamber, reached by a north staircase and used as a columbarium or dovecote, a very rare feature in a church. Below, the square, rib-vaulted chancel leading to the sanctuary shows the dimensions of the original tower. 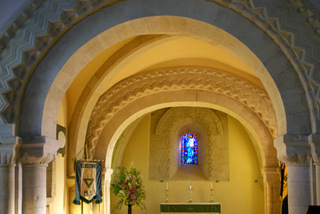 Its two zigzagged arches with deeply-cut chevrons are solidly Norman. The west arch has dragon head stops, the one behind the pulpit being original. The glow of light in the sanctuary is provided naturally through the two side windows: the south window is of the 13th century and the north window is in the 15th century perpendicular style. The stained glass in the tiny east window was replaced in 1929 with a Virgin and Child by Henry Payne of Amberley. The rosettes of its Arts and Crafts style echo those of the surrounding Norman stonework. The grotesque faces strapped together at the intersection of the sanctuary’s vaulting ribs form a striking roof boss. The altar rails are of early 17th century woodwork. The wooden pulpit is also Jacobean, set on a stone base of fine 15th century craftsmanship. The reading desk, bearing the date 1604, is made from part of the sounding-board once over the pulpit. The nave has box pews and a 15th century font. Above the blocked north door is a fragment of wall-painting, possibly a St Christopher. The great west tower was built in the early 15th century. 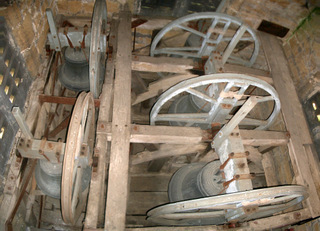 Its three stages contain the ringing and sounding chambers and the belfry with its six bells, the earliest dated 1657. Gargoyles still tease from the embattled parapet and two figures atop the massive buttresses play musical instruments. Over the west door remains the lower half of a stone Virgin and Child. Angels bear the arms of the Acton and Poyntz families. The porch, from the 14th century, protects a splendid tympanum over the south door. Christ is seated in majesty on a cushioned throne, with the symbols of the evangelists and the hand of God the Father above him. The fine beakhead ornament on the surrounding arch includes an inverted figure grasping the snouts of his neighbours; two human figures may be Richard de Cormeilles and his wife, probable sponsors of the church. The porch also encloses a tiny part of the corbel-table, also to be found on the north side, a gallery of carved stone animals, birds and signs of the zodiac, reminiscent of those at Kilpeck. The stained glass window in the south wall of the chancel was fitted in 1959, the work of W T Carter Shapland. The inscription reads ‘To the glory of God and in memory of Reginald Booth Rector of Elkstone 1893 – 1909. Also of his wife Ida who devoted herself to the welfare of this parish’. The window depicts ‘the beloved disciple’, Saint John the Evangelist. Above his head we see an eagle, John’s traditional symbol. The eagle, with its piercing eyes and immense wings, symbolises the heights John rose to in the stunning first chapter of his gospel. But John has another, later symbol. He is shown holding a cup. According to the ‘Acts of John’ (not in the Bible) John was challenged by the High Priest of the goddess Diana at Ephesus to drink from a poisoned cup, as a test of his faith, in the presence of the Roman proconsul. The potency of the poison was tried out on two condemned criminals, who promptly died. John prayed over the cup, drank and survived unharmed, then restored the two dead men to life. Down the centuries, artists have solved the problem of how to represent the poisonous liquid by showing a serpent or a dragon, nearly always green, emerging from the cup. Have a look at paintings by Hans Memling, Alonso Cano and El Greco – all can be seen freely online. The ‘Acts of John’ supposedly written by a certain Leucius Charinus in the second century, and purporting to be an account of the travels and miracles of St John the Evangelist was condemned as heretical. Jacobus de Voragine, Italian chronicler and Archbishop of Genoa recounted the poison story in his ‘Golden Legend’ in about 1275. The cup as a symbol of St John seems only to have been adopted since the thirteenth century. Whatever the legend, the Green Dragon is a reminder. From the cup, it reminds us that what really matters is the message of St John – the triumph of faith and love.